The Natural Areas Association (NAA) was founded in 1978 by a group of natural areas managers primarily from the Midwest, many of whom worked to manage prairies. The drip torch – a fuel canister with a wick used in prescribed fires, wildfire suppression, and other applications – is a key tool in prairie management. But the drip torch isn’t just an important tool for those working in natural areas. In 1995, the NAA adopted the drip torch as an unofficial symbol of the organization, and since then, a real drip torch has played a big part in a yearly event called Prairie Fire. The makings for Prairie Fire. Prairie Fire is a part auction, part team building, and a completely important NAA tradition. During the Awards Banquet at the annual Natural Areas Conference, an auctioneer takes bids for the Prairie Fire kit – two bottles of sipping tequila, several limes, a salt shaker, and a bottle of hot sauce. Members separate into “Burn Teams,” with names like the Blazing Bison and the Midwest Fire Monkeys, and bid on the Prairie Fire kit. Each team has a Fire Boss who is responsible for making the bids, and a Burn Safety Officer, who acts as an accountant for the money being pledged. The winning team will have their name, year, and winning bid engraved on the traveling trophy – a drip torch, of course. 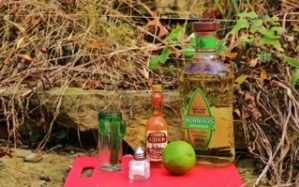 "The tequila is the drip torch fuel, and a generous dollop is poured into a shot glass. A few drops of hot sauce added into the tequila acts as the igniter. A line of salt placed on the thumb acts as the fire break, and a wedge of lime is the fire quencher. A toast is made and the tequila/hot sauce mix is downed." Prairie Fire is one of the most anticipated parts of each year’s conference. It builds community and shows the value of collaboration – and of having a good time after a job well done. It’s a recognition of what is best about our history and future as an organization.